Work started on the area around New Oxford Street on the 19th March and is expected to be completed by the end of August. 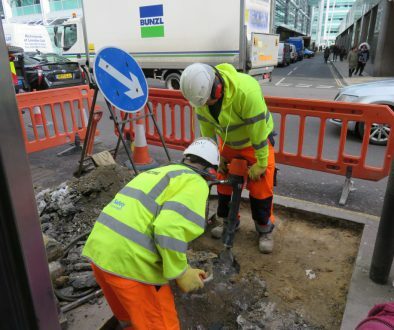 Our contractors VolkerHighways will be working on both sides of New Oxford Street, between Tottenham Court Road and Dyott Street as well as the Earnshaw Junction. We will be taking up and replacing the paving with granite slabs as well as taking up and re-laying some of the kerbs. We will also be completing the upgrade to the Earnshaw Street junction traffic signals and installing the new pedestrian crossing. We will work in small sections to maintain pedestrian access along the footways while also maintaining access to shop entrances and other doorways. Buses will continue to use New Oxford Street in both directions during the works, although it will be necessary to suspend bus stops when working close to them. Replacement stops will be provided nearby. 18th – 30th June, cabling the new signals at the Earnshaw Street junction and bringing the new pedestrian crossing on the east side into use. 25th June – 30th June, raising the road to footway level across the Bainbridge Street junction.